What better way to celebrate the major taking place right here in Southern California than a bright, shining, smiling sun? Our dancing ray-makers got a glow-in-the-dark grin (check it and see) that can light up any room--even a dark one. Not to mention his hipster shades to cool off in the hottest of heat. 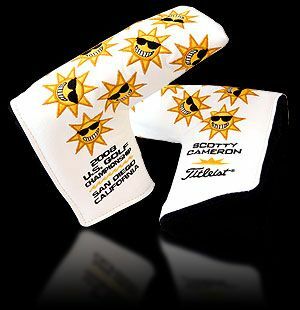 Originally offered in the Studio Store and limited to 2008 pieces this headcover was released in June, 2008 to celebrate the 2008 U.S. Golf Championship in San Diego.